Wooden Pergolas offer exciting all season structures for gardens, and we have been designing and installing in Harrogate, Yorkshire for some time. 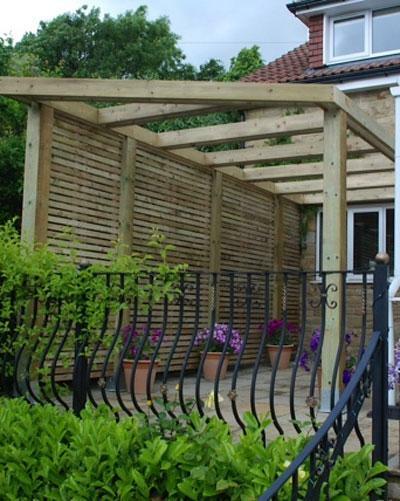 All our Pergola's are handcrafted using traditional carpentry skills. Our client presented us with a disused area of patio that they wanted to turn into a focal point and also create some privacy as the foliage on the surrounding planting diminishes substantially through the winter months. We designed and build a contemporary, double beam style flush fitting pergola on chunky 6" x 6" posts. The addition of the slatted screen to one side provides the required winter privacy without being too imposing. For further information or a free quotation please call or use our Contact Us page.